What happened last night in the VR, when Yanukovych 'twisted the arms' of several dozen PoR deputies to ensure they vote for a pro-government motion granting 'amnesty' to those imprisoned during the current troubles, is well described in this liga.net piece. Observers will have noticed the serious non adherence to parliamentary procedure and blatant cheating took place. It would even embarrass a rough-a**d pub darts team committee. Yanukovych allegedly threated renegade PoR deputies during a heated, closed meeting that he would disband parliament and prosecute those that did not adhere to the party line. [Most likely these are the same people that had 'lined their pockets with Yanukovych's blessing - so the 'owe him', so to speak]. Taras Chornovil, who for several years was a close adviser to Yanukovych considers many PoR deputies greatly fear the consequences of the current crisis being unresolved , and greatly fear personal sanctions, but they fear Yanukovych even more. Yanukovych could have permitted part of his fraction to vote with the opposition knowing that any new laws would not be adhered to in any case; but this would have been a politically fatal sign of weakness. Hence his unprecedented late-night rush to parliament to twist arms. One opposition deputy, Lesya Orobets, claims she was punched in the stomach when she tried to stop fraudulent voting. She claims 10 - 15 votes were stolen, and will now revert back to wearing a bullet-proof vest in parliament. Different presidential advisers are already giving different versions of what was actually voted for, because none of the parliamentary deputies and no parliamentary committees had sight of the new laws. For many hours after the vote no official version of the new law was published - no journalist could obtain hard copy. Do demonstrators have to clear some defined buildings? Or all of the streets? Will everyone imprisoned since the trouble started be released? The whole thing was a complete farce. Yanukovych and his party in parliament are looking a complete shambles. I have never before seen official PoR parliamentary talking heads so stressed out and shaken when being interviewed in the parliamentary lobbies. The waverers in PoR, many of them heads of large business corporations, will not forgive Yanukovych for his thuggish attitude last night. PoR deputies are truly scared - they are most aware that the situation in Ukraine could not get very ugly indeed. Their advice now to one another is: "Get your families out - as fast as possible." Parliament should be an independent branch of government. But now that serious cracks have appeared in the PoR fraction they will no longer be repairable. As I have previously mentioned law enforcement agencies are also incompetent and discredited. They are allegedly being paid big bonuses 'up front' to do their work and are apparently demanding 'dollars only'....Without support from paid thugs, the titushky, they would be even weaker. President Yanukovych has given away almost nothing today. Prime minister Azarov has gone...but he was already sitting on his suitcases, studying travel brochures, so to say. He was always going to be the token sacrifice in the event of pressure on the president. And he can remain acting PM for two more months..
Scrapping of the authoritarian laws passed by parliament nearly two weeks ago by the most shameful cheating will make little difference to to barbaric behaviour of law enforcement agencies. Even today there are reports that the injured are being plucked from hospital beds by law enforcement agencies. The whereabouts of many others is unknowm. One of the leaders of AvtoMaidan is still missing after a week. EuroMaidan will not in any way be impressed or feel safer. Serhiy Vysotsky in a Liga.net article considers Sunday's violent scattering of demonstrations outside State Oblast Administration buildings in Dnipropetrovsk and Zaporizhzhya by riot squads and large numbers of 'titushky' [young thugs armed with sticks and organised and paid by the authorities] significantly harms the prospects of Party of Regions in those Eastern Ukrainian cities. Until now a large proportion of the residents of these cities have been ambivalent to, or even critical of the EuroMaidan protests. Many dozens of people were injured, including six journalists in Dnipropetrovsk alone. Many people have been arrested after being chased for hundreds of meters then beaten. Videos showed totally innocent, terrified bystanders beaten and forced to seek shelter in apartment buildings where strangers let them in. Active participation of titushky can be seen in this video: they wore yellow armbands for identification so that police and riot police goons would not attack them 'by mistake'. In these two cities the ruling elites are quite diversified and have never been purely pro government or pro opposition. They have always co-operated with whoever was prepared to defend their rights at the central level in the organs of power. It is most probable that the five to ten thousand demonstrators in each of the two cities were tacitly supported by some fractions of these local elites whose assets have been systematically under attack by Donetskiites appointed by Yanukovych. The massive overreaction of law enforcement personnel will increase discontent amongst the locals and weaken Party of Regions' support in these two important cities in a big way. p.s. Pinchuk and his pals from YES appeal to Europeans and Russia to sort out the Ukraine's problems. I believe there is only one problem, as British PM allegedly noted when describing Yanukovych: "He's from a different civilisation." Katya Gorchinskaya describes this different civilisation in this excellent 'KyivPost' article. It really is as bad as that..
A few words about Vitaliy Klychko. Over the last days and weeks of the crisis he has definitely gained gravitas, despite some commentators suggesting his oratory skills are limited. He speaks in short, crisp easily understandable sentences - ideal for all-important television sound-bites, and looks a most credible presidential candidate. As a long-time top class boxer he faced cameras and journalists hundreds of times and is a confident performer, particularly when speaking in Russian. He is familiar with techniques of outstaring and talking down opponents at pre-fight press conferences. He instinctively knows during a boxing match when he is getting the upper hand, and when to attack. I believe he puts this to good effect in his crisis meetings with Yanukovych - a guy who is easily bullied or browbeaten. Klychko is certainly his equal. There were rumours that at a meeting a few days ago when Yanukovych proposed cabinet posts to Klychko and Yatsenyuk, Klychko responded: "Right now you are sitting in my chair.."
He will have no problem gaining big financial support from backers who quickly recognise a winner..
p.s. No-one has noted quite how easily opposition activists managed to seize the Ukrainskiy Dim conference hall close to Hrushevsky Street were the worst of the trouble is, a couple of nights ago. Riot police and security forces had been using the hall as a billet for eating and resting. A few dozen youths with sticks and stones smashed the windows, and after a few hours those inside gave up and walked out through a corridor of protesters. Why was the conference hall so unprotected? No windows were boarded up, no sandbags, barricades or barriers of the kind that are seen throughout the world for crowd control were in position. Same goes for other ministry buildings that have been stormed. I have written previously how the Lenin statue had been assaulted during two weekends. But even on the third when it was toppled, there were still no barriers around it. It had not even been boarded up. Why have government ministers, particularly those of the power structures not gone down to the front lines and demanded to to be photographed offering encouragement the police and riot police under their control who have been standing in the freezing cold? The Berkut and other security force leadership are utterly incompetent, particularly when it comes looking out for welfare of their rank and file who must by now be well and truly demoralised. Ukraine's opposition knows that under the current Ukrainian Constitution, [which was amended during Yanukovych's presidency to strengthen his position] Yanukovch can fire as well as hire cabinet ministers.. Proof of this is the offer Yanukovch made which includes the sacking of current Prime Minister Azarov. The offer of cabinet posts to Yatseniuk and Klychko are therefore worthless.. Dozens of PoR deputies are keeping 'their heads down' incommunicado, so to say. A pro-Yanukovch majority in parliament is now probably unattainable. Nevertheless, deputies can switch their support from pro-government to anti-government and back in flash so, again any undertakings given by PoR deputies are also 'jam tomorrow'. The opposition leaders, and protesters on the street, have nothing to fear but must demand concrete irreversible steps from Yanukovych before giving any ground themselves. The cracks in the ruling authories' dam that have appeared these last two days, and the recent events across the country in regional capitals are most encouraging for the opposition. Civil unrest increased in the country over the past week and led to loss of life. We must voice our position as human life is the absolute value. We wish to express our deepest condolences to the families and relatives of those who lost their lives. Business cannot keep silent when people are killed, a real danger of breakup of the country emerges, when a political crisis can lead to a deep economic recession and thus inevitably result in lower standards of living. It is only by peaceful action that the political crisis can be resolved. Any use of force and weapons is unacceptable. With this scenario there will be no winners in Ukraine, only victims and losers. But most importantly, the use of force will not help to find a way out. The only solution is to move from street riots and attempts to curb them [my bold text and italics] to constructive negotiations and results. The negotiation participants must pursue the interests of the whole country. The whole country! And they must be ready to actually cooperate and find a compromise. For the sake of the future of the entire Ukraine and each Ukrainian. Akmetov controls around two dozen or more deputies in parliament, enough to swing any vote, so this statement is v. significant. His statement makes clear he is against a violent clearance of EuroMaidan..
Ominously, many hundreds of youths of sporting/criminal appearance, so-called 'titushky' seem to be being shipped into Kyiv. This is causing great consternation amongst ordinary citizens as they roam around the streets. Self defence groups are being organised. Military personnel or military equipment are unlikely to be employed at the moment, perhaps because loyalty of the army is not solid. Storming and scattering of EuroMaidan will be difficult without heavy military equipment on account of large barricades and also icy road conditions. Following his meeting with the opposition leaders it's clear Yanukovych is not prepared to make any concessions at all. Violent protesters seem to be an almost random mix by age and status - check out the videos. Some are well dressed in high quality skiing/motor cycling gear, others are obviously labourers/farm workers or similar - and everything in between. Many middle-aged and even elderly women bringing food and sandwiches...offering verbal support. A front line of 'fighters', but a many, many just behind them, a reserve of some sort, offering moral and material support. I suggest this is most significant because those who are prepared to resist come from a wide spectrum of society..Many are from Kyiv, but there are many from all parts of Ukraine..some are probably adrenalin junkies...But agents of some mystical 'foreign power? Hardly...No-one does this sort of thing except out of idealism. Protesters captured by the police or Berkut have been systematically severely beaten by groups of law enforcement personnel, and in a couple of cases, killed. There have been dozens and dozens of victims. Some observers explain this as follows: Joint participation in such dreadful activities cements police solidarity. These is a classic tactic of criminal and mafia gangs for guaranteeing loyalty. Many of the hundreds of injured protesters are being denied medical treatment or are being systematically whisked away from hospital wards by Berkut troops. They are then maltreated, locked up or released. Hospitals are surrounded by Berkut troops in buses waiting to pounce. Doctors are being ordered not to sign in the injured for treatment.. The field hospital on EuroMaidan with its red cross flag markings was trashed by Berkut today and volunteer medical staff injured. One doctor was shot with rubber bullets. Civic activist Ihor Lutsenko and a colleague who has subsequently been found dead were kidnapped from a clinic by a by a 'death squad' of about 10 law enforcement personnel in front of hospital staff yesterday. Lutsenko was beaten up, a bag placed over his head..and he was left in a forest near Kyiv after being told 'to say his prayers'.. His colleague was murdered. Many injured protesters are refusing to go to clinics and hospitals because they fear the consequences. Shell cases scattered over the ground on Hrushevsky Street indicate that weaponry banned by international conventions is being employed. In credibly, 42 journalists have been injured so far on Hrushevsky Street, many working for foreign mass media. Some have been shot or beaten up by 'titushky'. It is pretty clear they are being singled out for special treatment. Some no longer bothering to wear hi-viz press jackets for safety. With all the talk of sanctions and seizure of foreign bank accounts belonging to Ukraine's leaders, there are rumours that not that much cash is actually stashed abroad. The Lazarenko case makes Yanukovych and his pals wary. There are probably huge stashes of cash/gold/gems etc. in Ukraine - which partly explains the extreme paranoia of Yanukovych and co. Most bribes are paid in cash...there have been credible reports over the last years that car loads of cash are being regularly delivered to Kyiv from the provinces and from customs crossing points..Yanuk just loves his gold bathroom fittings and toilet, vast chandeliers, marble massage tables.. There is no sign that violence will subside any time soon. Both sides of the conflict are resolute in their positions. Social media are filled with names and addresses of Party of Regions leaders. I shudder to think what will happen if more protesters are killed. This is the start of a revolution... Is it legitimate? Will it succeed? I'll leave the reader to decide because no-one knows..
Its still difficult to comprehend what happened on Hrushevsky Street. At its peak there were up to 30,000 people on that street on Sunday, up to five thousand of whom were actively involved in the clashes. Moreover, even if right-wing activist organizations/provocateurs where at the leading edge, then they were clearly not in the majority. The bulk were ordinary people who had just had a 'belly-full' of the current regime. If this was indeed provocation then its aim was not the clearance of Maidan, because this did not actually occur. Some blame can be attached to the right-wing radicals or to AvtoMaydan activists for urging people to picket the Verkhovna Rada, but it is primarily the blind authorities who are to blame for the unfolding street battles. Following the adoption of a package of repressive laws on January 16 it became clear to demonstrators that whether you picket a house of burn it down you'll get the same sentence - two years, so why hold back? After last Sunday's EuroMaidan on January 19, the thousands of people who attended understood it was last opportunity to defend violated rights and freedoms. The passivity of opposition leaders did not correspond to the mood of those that had gathered or activists who knew the new laws threaten them to up to 15 years in prison. When people feel that they have nothing to lose except the opportunity to be beaten and convicted, peaceful protest ends. This poses a big challenge to politicians and to the state because this violent mass of people who are ready to go to take extreme measures will not accept compromise. The Klyuyev-Portnov-Lukash government arbitration commission is judged by protesters to be a cynical challenge. Andriy Klyuyev initiated violent attacks on the EuroMaidan late November. Olena Lukash stated that the police have the right to use force to the protesters, Andrei Portnov is the guy who oversaw the shameful January 16 laws. Yanukovych will not make concessions, and the arbitration commission will regarded as a stalling tactic giving extra time for supplementary troops to be assembled in Kyiv. Therefore, the only chance for a political settlement exists only in Parliament. The pro-government majority deputies, as well as judges and law enforcement officers, should now understand that if the mass protest is severely suppressed by means of military weaponry and people killed, they - the middle tier of power will be the first victims of the resulting guerilla warfare. Inevitably retaliatory terror in response to violent suppression will take place. Many many thousands of people support the protester on Hrushevsky Street. The scale of the reaction to repression by the authorities in Kiev is difficult to imagine - it could be massive. A small possibility for some political compromise still exists, and the personal political future of many 'Rgionals' still has some perspective. But when the first man in the street dies from a bullet the only question will be the personal physical security of parliamentary supporters of the government and its officials - and Ukraine may lose its statehood. All that stands between crisis resolution and a scenario of full civil conflict is the wisdom of members of the Party of Regions faction and the sponsors of the party, as well as on the degree of international pressure on them. What Vysotsky is proposing at is if the crisis deepens, revenge will be taken against PoR officials, judges and officials across the country. As in previous weeks many journalists were again targetted and shot with rubber bullets, and also beaten. Just on Sunday and Monday, there were more than 20 seriously injured. Taras Berezovets, a political analyst I rate, says: "An entirely new generation has grown up [in Ukraine] that does not know the "soviet" mentality. Politicians lag a long way behind . People are willing to participate in an armed confrontation. In the eyes of these people there is no fear. Attempts of dispersal will fail..."
Demonstrators have nothing to lose. Their life-chances have been constantly blocked and crushed for years, while those few in charge have bled the country dry and disgustingly flaunted the wealth they have stolen. The country is now almost bankrupt....The hatred and contempt demonstrators have for the ruling authorities resulting from years of humiliation and injustice is massive..hence the violence. As I predicted, "big trouble" has taken place today. At the lunchtime 'EuroMaidan 'it was apparent that many of the crowd were dissatisfied with the half-hearted indecisive proposals and appeals of the opposition political leaders. Wolf whistles and jeers were heard for the first time ringing around Independence Square. Other more radical civic leaders received a better reception, particularly when they proposed more radical, direct, but nevertheless peaceful action, including picketing of the Verhkovna Rada building. Up to a thousand radical protesters from various parts of the country, not provacateurs, picked up this initiative. They were intercepted by Berkut special forces on Hrushevska Street and the situation spun quickly out of control. Buses and other vehicles were burned, thunderflashes thrown, many were injured. Violence continues as I write, and can be seen on hromadske.tv website. Radical protesters have finally lost patience. They know the ruling authorities have robbed the country blind over the last few years, and have cynically abused their power. If the economic situation was better, these young protesters could perhaps be bought off, but they now realise the government cannot, and will not, improve their lot, they have no future in the current set-up. The new authoritarian laws so cynically passed last week were the last straw. Opposition leaders have failed to deliver, and can offer nothing. The blame for the mess lies at the door of president Yanukovych who has stubbornly refused to contact and listen to the demands of civic leaders who are the driving force of the protests, or conduct any meaningful dialogue with opposition politicians. Getting the genie back into the bottle will now be very difficult.. I see the bad moon rising. Bad Moon Rising -Trouble on the way? As the result of legislation 'passed' in parliament a couple of days ago, then almost immediately signed off by the president, "..on paper, Ukraine is now a dictatorship." It is dawning on the electorate there will be no realistic possibility of resolution of the current Ukrainian crisis by normal democratic means - that of free and fair presidential elections in Spring 2015. Valeriy Pornikov, in a recent article, points out the naivety of Yanukovych's strategy in following Putin's path to authoritarianism, because different situations exist in their respective countries. In Russia, Putin has introduced authoritarianism by stealth, bit by bit, over several years, with no major protests along the way. In Ukraine, the new laws have been passed 'out of the blue' at the height of a political crisis. A significant portion of Moscovites support Putin wholeheartedly, whereas Kyiv city centre is the heart of protests that are supported, probably, by a majority of the capital's citizens. Putin's trump card is that he can buy off disgruntled members of the electorate with revenues generated from export of hydrocarbons. Yanukovych does not have this option - the state coffers are empty. Pornikov concludes: Representatives of dissent are the leaders of the parliamentary opposition parties who [in order to retain legitimacy] are restricted to political dialogue rather than any proposal to use force to seize power. The fact that there has not been any [crisis resolution] dialogue is not the fault of the opposition or of society, but rather is a tragedy for the country, because in any civilised country such a great many people on the streets would lead to their complaints being heard, and a mutually acceptable compromise formula being found - which is even more important bearing in mind the country's regional differences. Today Ukraine has stalled between an authoritarian model of the post Soviet type, and the radicalisation of dissent which may no longer be capable of being coordinated by the parliamentary opposition. The result could be full-blown dramatic conflict, with no winners. The depths of the shamefaced depravity that so-called Ukrainian parliamentarians stooped to yesterday when voting in copy-cat Russian/Belarussian-style repressive laws can be seen in this photograph from opposition deputy Lesya Horobets' Facebook page. Only 120, tops, had hands raised to provide Ukraine with many of the attributes of an authoritarian state...well under the minimum 226 required to pass any legislation and about half of what the official parliamentary register shows.. The laws, and the manner in which they were voted through is clear indication of the deep psychotic fear in Yanukovych's heart. In any European country such behaviour should be absolutely and totally unacceptable. The time for clear messages has arrived. Western governments must annul visas to all pro-government parliamentarians immediately..unless they can produce photographic record they are amongst the 120..To stand by and do nothing is to condone the cheating. Leaders of pro-government factions and parliamentary speakers should be singled out for extra attention. High-profile grease-ball PoR deputy and crack-pot legal eagle, head of the parliamentary counting committee, Volodymyr Oliynyk is now calling for a dialogue with opposition deputies...He is the co-author of the repressive anti-journalistic new laws..
p.s. Having watched several PoR spokesmen on tv, my impression is that they realise the new laws will do little to solve the current problems...and Yanukovych and his parliamentary bloc may have gone too far. In short, I think they fear the new laws will not work. A big EuroMaidan turnout on Sunday will further increase their apprehension. The rag-bag of 'cut and paste' legislation " steamrolled through parliament on Thursday by the most cynical of methods will almost certainly be quickly signed off by Yanukovych and become law. Senior members of PoR declare [imo correctly] that Ukraine is undergoing the greatest crisis in its short history, and openly admit the punitive new legislation is intended to quell the EuroMaidan and reduce what they consider to be, in their words, "the risk of civil war". Yet they know well there is no risk of civil war. EuroMaidan is not against any other Ukrainian region. EuroMaidan stands for European values - exactly those values of transparency and accountability that threaten the future prospects of Yanukovych's gang of corrupt mobsters. Hence the passing of the new highly repressive laws in parliament today. In the brief history of independent Ukraine it citizens have not had to 'dig deep' either to gain independence or to fight for their rights - for European values. The next days and weeks will show how much millions of Ukraine's citizens really want these rights and the dignity they provide. Many realise this might be their last chance...the longer Yanuk and his banda remain, the more difficult they will be to shift..
p.s. Shortly after Yulia Tymoshenko was arrested I suggested there was a 60% chance of 'Belarusisation'of Ukraine, and a 10% chance of the toppling of Yanukovych. The new legislation is in large part based on laws existing in Ukraine's nothern neighbours. I have blogged previously about the concerted campaign of terror implemented against peaceful protesters and members of the opposition. In the last few months dozens and dozens of activists and journalists have been beaten up, opposition party Batkivshchyna headquarters raided and computer servers removed with no explanation, and hundreds of protesters have been systematically harassed and persecuted. The probability of escalation is high, and Ukraine is facing the greatest crisis in its short history. Serhiy Vysotsky, a serious commentator not known for sensationalism, explains in Liga.net how little time remains before matters spin out of control. Repression against protesters has unfolded rapidly throughout Ukraine. People are being beaten, their driver's licences are being taken away from them [participants of AvtoMaidan protests in particular], and criminal cases opened against them. Protesters' property is being damaged and they are being threatened with lay-offs. The authorities' tactics are clear: having ignored the Maidan, they are trying to isolate its co-ordinators and leaders with the aim of neutralising them. Vysotsky claims up to four million people have in some way participated in the current protest actions. He continues: The peculiarity of the situation is that official repressive forces have been bolstered by openly criminal forces. Even the 'sylovyky' are now employing gangster-like methods of intimidation. It is already clear that the use of the police and the Security Services will not be able to stop or restrain protest. The EuroMaidan, which has now stood for fifty days, will not disperse itself. Massive criminal terror could potentially be employed, but in order to stifle protest, terror in Ukraine would have to be on an "African" scale - thousands of thugs armed with machetes used to scatter crowds. Organisers of self-defense could potentially generate a wave of counter-terror possibly against the residences of Ukraine's current leaders. Any such radicalisation would lead to serious casualties on all sides. Vysotsky concludes the only way to prevent such escalation is to abandon the practice of employing criminal elements against activists immediately, and quickly move to the purely political methods of settlement of the dispute. Parliament returns to work on January 14 and should make crisis resolution a priority. Any delay significantly reduces the likelihood of a political solution to the crisis. Tetyana Chornovol today gave her version of events leading up to her vicious beating in the early morning of 25th December. She claimed no-once else, not even family were aware that she was heading home from Maidan late the previous evening. Very soon after leaving Maidan, on Institutska Street, she noticed that she has picked up a tail and two cars were following her. This had happened previously on several occasions so as she approached her home village she drove round some backstreets to shake them off. With one vehicle still on her tail, she decides not to risk going home and starts to drive back to Maidan. Icy road conditions and a lack of winter tyres made it particularly difficult for her to elude her tail. Chornovol's account discredits Serhiy Kotenko's version of events. Kotenko incredibly asserted that he was trying to sell the Porsche Cayenne used to attack Chornovol's vehicle but was tricked into allowing two previously unknown prospective purchasers to give it a road test in the middle of the night. He claims it was they who smashed up his Porsche and also beat up Chornovol while he sat in the back seat of the car. If Chornovol's version of events is true is not unreasonable to assume that her car was under surveillance while she was on the Maidan on the 24th. The presence of another, "control" vehicle, indicates preplanning and collusion. Kotenko was an integral part of the plan. No mention of a second vehicle has, to my knowledge, by made by any law enforcement official, to date, nor is any second vehicle being sought or identified. As in any capital city there are plenty of traffic control surveillance cameras placed along the route Chornovol travelled on that night. It is not unreasonable, therefore to consider a serious cover-up is taking place of a crime for which the perpetrators would serve many years in prison in most normal countries. "The medical condition of journalist Tatiana Chornovol, who suffered from the result of a beating on December 25, 2013, is stable and satisfactory. This conclusion was reached by a concilium of physicians held on 6 January 2014. The concilium confirmed that the treatment of the patient in hospital has been completed and she no longer needs to stay in hospital. According to doctors, Tatiana Chornovol can be discharged and can return home; further medical supervision can be provided on an outpatient basis by specialist professionals. As previously reported, the patient - Tatiana Chornovol - born in 1969, underwent a course of medical treatment at the "Borys" private medical clinic for thirteen days. She received comprehensive treatment in full in accordance to protocols agreed by the clinic's experts and consultants from other health care facilities. Press Service of the Ministry of Health of Ukraine"
This all strikes me as very peculiar, to say the least. Is it an attempt to talk down the gravity of Chornovol's injuries before a worldwide audience of observers? And what business is it of the the Ministry of Health to comment on treatment being provided by a high-class private health care establishment? If Ms Chornovol does not wish to be discharged surely this is matter between her and the clinic...no business of the Ministry. And most importantly, Ms Chornovol's apprehension of being discharged is most understandable. She survived what was most likely an attempt on her life, and was horribly beaten about the head, resulting in multiple fractures and serious concussion. She still suffers pain and dizziness...and probably from some degree of post traumatic stress disorder.. The attempt on her life could well have been commissioned by highly-placed government officials whose corrupt criminal excesses Chornovol frequently exposed. They may even be linked to ministry of health officials. One of her alleged assailants is still at large. She has every reason to be fearful another attempt could by made on her life. In the last weeks hardly a day goes by without another report of serious beatings of opposition activists, torching of vehicles, serious police harassment, unauthorised detainment etc. etc. In light of this the Ministry's statement is totally out of order...almost as bad as the assault on her initially being categorised by law enforcement officials as 'hooliganism'.. Evil mind's could interpret it thus: "They tracked her, beat her up within an inch of her life...now the're saying she's ok...fixed...good as new...just one of those things...let's forget about it all..no reason for all the fuss." p.s. According to one of their presenters Tetyana Chornovol may be interviewed on hromadske.tv tomorrow. If Chornovol is hospitalised for over 21 days her assailants would face imprisonment up to 10 years for 'grevious bodily harm'. A lesser duration in hospital would mean her assailants would be charged with causing bodily hard of much lesser gravity, and would only face a 2 year stretch..less time off for good behaviour etc. etc..Get the idea.. Likelihood of visa restrictions and sanctions increasing..
"Gianni Pittella, the Vicepresident of the European Parliament, spoke in Kyiv’s Maydan Nezalezhnosti in front of several hundreds of demonstrators who support Ukraine’s integration within the EU. Vicepresident Pittella stressed that Liberty and Democracy are rights that must be respected in Ukraine, and he added that Ukraine is an European country for historical, cultural and social reasons. “I’m gonna ask the European Parliament to provide visa sanctions for those Ukrainian authorities who do not respect human rights and democracy. It is not tolerable that opposers and their advocates are jailed and political prosecuted, as well as journalist are beaten” Vicepresident Pittella said. Vicepresident Pittella added that he will push the Italian Parliament to fight for Ukraine’s integration within Europe during Italy’s rotating Presidency of the EU, and underlined the necessity Italy will offer medical treatment for Yulia Tymoshenko as well as Germany already did. “You are our brothers because you, the Ukrainians, are a part of Europe. The Progressive Alliance of Socialists and Democrats in the European Parliament and the Secretary of the Democratic Party of Italy Matteo Renzi send to Ukraine, through my speech here in Kyiv, their support for your nonviolent struggle for Europe and Liberty” Pittella stated." Despite some contrary opinions, application of sanctions are certainly worthwhile, not least because of the moral boost they would provide to opposition activists. The also let organisers of violence against peaceful protesters know that their is a price to be paid for their deeds. p.s. Former president Yushchenko knowingly gave false testimony when he appeared as a prosecution witness in the Tymoshenko gas case, according to some experts. In most countries such a crime is punishable by lengthy imprisonment. He likes to 'swan around' capitals of the world on the back of what little reputation he still has. 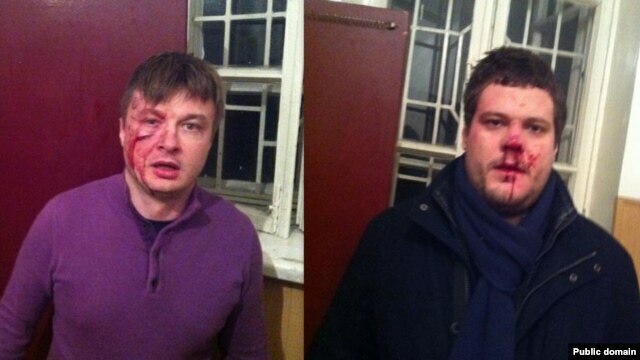 Put him on the list too..
Tonight 'Svoboda' parliamentary deputy Andriy Illyenko and his lawyer, Sydor Kizin, where severely beaten by a gang of thugs. The pair had just left the Shevchenkivskiy regional police administration building in central Kyiv where they had been summoned for questioning. Illyenko has declared only he and the police investigator with whom they had conducted the meeting knew where it was to take place. Several of the assailants followed Illyenko and Kizin as as they left the building. The attack took place moments later, less than 100m down the street, when the pair were confronted by the remainder of the gang and their retreat cut off. Up to ten thugs were involved. There can be little doubt that since the EuroMaidan took off an organised campaign of intimidation is under way directed against Yanukovych's opponents. Such events will only deepen the crisis and stiffen the resolve of protesters. He is the man who owns one of the biggest industrial/financial conglomerates in Europe, and is one of Europe's wealthiest men, yet he acted like an adolescent complaining in a fit of temper how unfair life was. His biggest gripe seemed to be that the activists were claiming he was in London. He pulled over in his big Merc just to prove he was not, and that they were lying; yet no-one pointed out that he owns a fleet of jets - he could be in Ukraine for breakfast, London for lunch, and back in Donetsk for teatime..
Akhmetov has an army of lawyers and bodyguards to pander to his every whim, and a team to sort out his P.R., so why the personal outburst? I think he tackled the protesters with good intention but without much forethought. The reclusive Akhmetov, normally immaculately dressed whenever he appears in public ...looked distinctly 'casual' in track suit and trainers, almost scruffy. There were no minders with him who would have urged him to refrain from stepping amongst the dozen or more protesters and journalists. I think it was done spontaneously to show other members of the government that "we got to stand up to these guys", not hide behind high security fences in our massive residences which are, as Yuriy Lutsenko puts it, "filled with slag heaps of stolen tat".. Unfortunately, instead of inviting the protesters inside for a cup of coffee and a friendly chat, he seemed to 'lose it'. After offering seasonal greetings he gradually started speaking rather incoherently in an emotionally charged manner, waving his finger at everyone.. He claimed in his outburst: "All say sanctions, sanctions, sanctions..." Yet the protesters were not saying anything about sanctions at all. Is someone from abroad putting the squeeze on Rinat in this regard?" Freudian slip perhaps? The entire 'Yevromaidan' is being driven by the regular joe in the street, many of them i.m.o. younger and more sophisticated that than any of Ukraine's politicians, hence no-one can say for sure where it is all heading. This is why the likes of Akhmetov find it so disturbing. They know the hundreds of thousands of protesters are having 'positive emotional experiences' attending the 'Yevromaidan' rallies which generate an intoxicating blend of joy, unity and pride amongst participants. They have amazingly surprised themselves how it has gone so far. These feelings, linked with an edge of danger and fear, cannot be easily erased. Ironically Yanukovych, Akmetov and the rest are more entrenched in power than ever before, but they have never before been so fearful about their future because they have nothing to match this. Any pacification attempt will be massively counter-productive. Akhmetov's instinct is probably correct; the opposition must be contacted and a proper dialogue commenced if the Donetsk ruling junta are to have any long term future in large swathes of Ukraine..even if his attempt was inept. Sadly, the president and his ministers still have their heads up their a**. In his report on the New Year celebrations interior minister Zakarchenko, most childishly, did not even mention the hundreds of thousands who were in the Maidan in Kyiv last night, [perhaps 'The largest New Year's Eve party in Europe.'] He did claim though that : "The most crowded events took place in the Dnepropetrovsk region (43 events attended by 165 thousand people) and in Kharkiv (where almost 90 thousand people took part in 34 ceremonies).